Photo of the Blashfield Gallery from the Lawrence Hall archives. Williams College Museum of Art (WCMA) opens The Presence of Absence: Medieval Art and Artifacts on August 18, 2017. The exhibition employs object-oriented ontology to recast the relationship between humans and nonhumans. Instead of passive objects installed simply for the pleasure of human viewers, the works of art and artifacts shape the physical interactions people have with them. 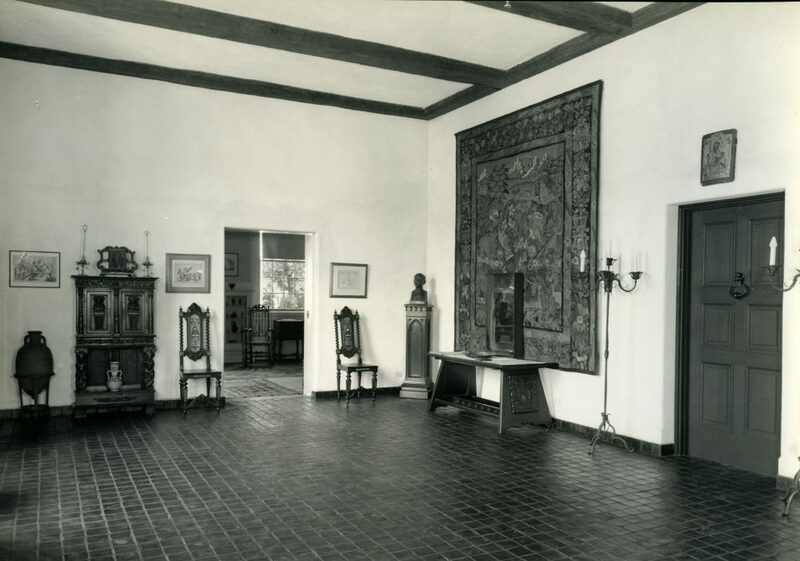 The Edwin Howland Blashfield Gallery was originally constructed in the 1930s to evoke the Medieval era, and to hold WCMA’s Medieval and Early Renaissance collections. It was boarded up for over a decade, when the gallery was turned into a “white cube” space. Now newly restored, leaded and stained glass windows have been revealed, the tiled floor refurbished, and the beamed ceiling brought back into its original context. Light plays a significant role, both metaphorically and physically. The desire to illuminate something long-hidden led to the renovation of the gallery and rediscovery of objects in the collection that have not been displayed for many years. Physically, the light pouring through the leaded windows illuminates the French grisaille with stained glass hung in the window frame. The deeply-carved 400 lb limestone capitals are reanimated by the shadows and natural light playing on their surface. As the sun travels across the sky, reaching the west-facing windows in the afternoon and evening, gilded paintings opposite the windows glow from the reflected light. The objects themselves represent the presence of the Medieval period, but the absence of their original contexts. Although the societies and people that fashioned nonhuman materials into these works of art are long dead, they live on as a spectral presence in our present. The works have accrued their own histories, which affect their relationships with humans and nonhumans alike. There are some experiences and associations that we can never fully access and, therefore, some ways of relating to the objects that are lost to us. The ecclesiastical bell, for example, would have been consecrated in a manner analogous to baptism, and for this reason could be considered to have as much presence as a human. Visitor expectations of how museums stage, place, and describe objects are purposely subverted. Some objects, such as a beautiful ivory triptych, displayed closed, will keep their own company, while others will come off the walls to enter the space traditionally reserved for the viewer. Object-oriented ontology was developed in part as a way of thinking about the increasing pressure put on humans by climate change. Rising seas, shifting weather patterns, and mass extinctions entreat us to pay attention to nonhuman forces. The objects in this exhibition also remind us of an earlier stage of our own possible destruction. After all, the people who created these objects are long gone. Yet the precious materials of gold and ivory that make up or decorate many of the works are still coveted even though we understand the ecological damage done by mining or the risk of hunting elephants into extinction. This tension between human and nonhuman forces should make us aware that a world without humans or other animate beings may be closer than we think. The Presence of Absence enacts a dismissal of the dichotomy between subject and object, positing instead that we—humans and nonhumans alike—are all objects. The atmosphere in the gallery lends itself to meditation and discovery, the questioning of conventions, and speculation on how our material culture will be perceived by future humans or nonhumans. Celebrate the fall exhibitions: Barbara Takenaga, Pink Art, The Presence of Absence, and Object Lab. Contemplate the weird, the eerie, and all the ways objects haunt us with Kevin Murphy, Senior Curator of American Art.